Gaming has always been a part of my life, and as I have matured, I’ve picked through games and genres to find what I enjoy the most. Although I haven’t played every Zelda game and I don’t necessarily adore every single one I have played, I love the franchise and I love that style of gaming. A Link to the Past was my first Zelda game, as well as the first video game I ever played, introducing me to the Zelda series and always having a special place in my heart. After a Link to the Past, I jumped into Twilight Princess on the Wii. 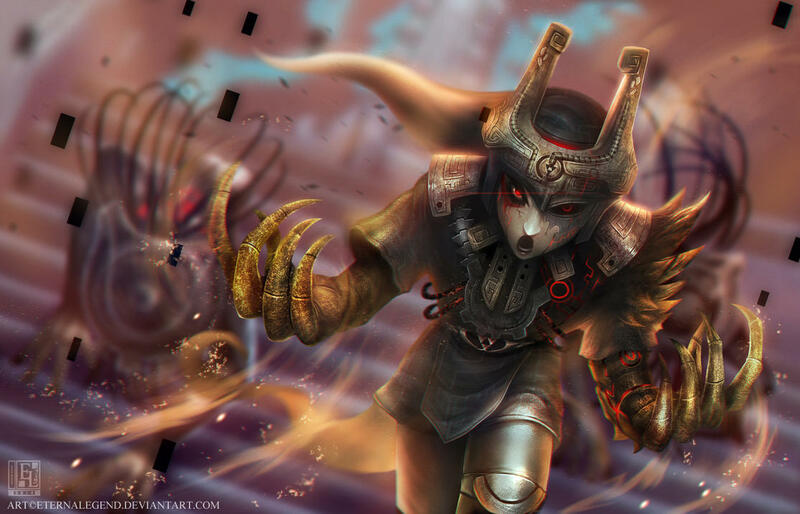 Twilight Princess, following after Majora’s Mask with a darker design and more somber plot elements compared to other Zelda titles, opened up a new world to the Zelda series, further inspiring other developers and games. Released just a year sooner than Twilight Princess was Shadow of the Colossus, but both games resemble each other quite a lot. 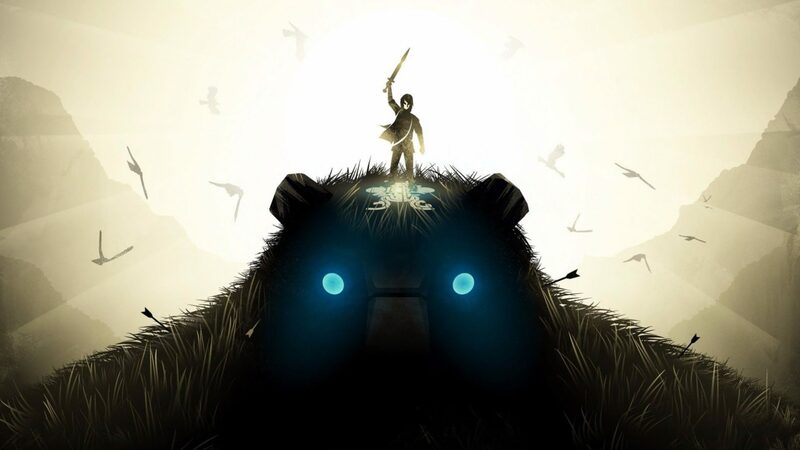 The likeness of the two games are not purely coincidence, as Shadow of the Colossus lead-developer Fumito Ueda had stated in a early interview. Ueda admired Shigeru Miyamoto and aspired to create games to impress him. The Colossi were designed after Zelda bosses, with Ueda even calling them “inverted Zelda dungeons”, referencing the innovative design of some Colossi being a “dungeon” in and of themselves. After playing both games through again, I started to notice so many similarities. Other than the obvious — the hero wielding a legendary sword accompanied by his reliable steed on a journey to rescue a maiden cursed by a terrible fate — comparisons go even further than just the main plot of the stories. Twilight Princess is focused around a farm boy named Link who finds that the land he once knew is now completely covered in Twilight. Link is accompanied by an imp named Midna, who happens to be the Twilight Princess herself. The duo’s goal is to bring life back to a group of Light Spirits to save Hyrule from the “King of Twilight” Zant, who is influenced by the malevolent Ganondorf, and save a trapped Princess Zelda, who was forced to surrender and is now helpless against the darkness. After a tense confrontation with Zant, Midna is left clinging for her life, and Link takes her to Princess Zelda, who sacrifices herself to save Midna. Link and Midna are informed that they have to obtain the legendary Master Sword to defeat Zant and uncover a darker evil pulling the strings. Similarly, Shadow of the Colossus begins with a boy named Wander who wants to revive Mono, a girl who was sacrificed, by bringing her to the Forbidden Land. Upon entering a Shrine of Worship, Wander encounters an formless entity named Dormin. The voice of Dormin explains that the maiden can be revived under the condition that 16 Idols, representing 16 Colossi scattered across the land, are defeated. However, Dormin also cautions Wander that the completion of his quest may come at a great price. Ignoring the entities warnings, Wander goes on to face each Colossi, slowly uncovering a darker secret with each defeat. Notably different in some aspects, but nonetheless, both games possess comparable plot and design components. Both present a quest led by a young protagonist, a narrative based upon a central relationship between two people, and themes of reunification and corruption. Boss elements and mechanics are the largest similarities between the two games. The unique air battle with the dragon Argorok in Twilight Princess resembles the the 5th and 13th Colossi Avion and Phalanx Shadow of the Colossus. The sub-aqueous fight of Morpheel resembles the 7th colossus Hydrus. Even in a more subtle way, Armgohma resembles the 8th colossus Kuromori, as the heroes must drop a beast on its back to attack its underbelly. 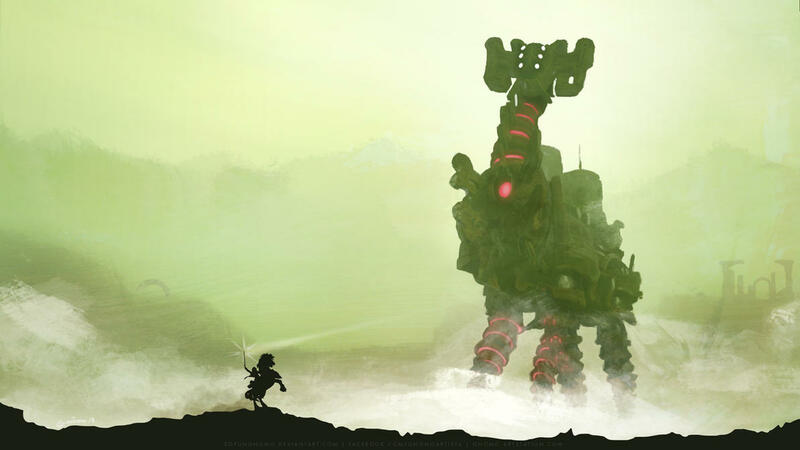 As well, Stallord resembles the 10th Colossus Dirge, as both involve a battle in desert sands. Although Zelda games explore more combat mechanics than Shadow of the Colossus did, the foundation of boss mechanics are remarkably similar. Despite the fact that my main comparison will be Twilight Princess, I do have to acknowledge Breath of the Wild‘s Divine Beasts design is undeniable to over look compared to the Colossi. The art styles of the two games are very similar as well. Comparing the most recent releases of the games, Twilight Princess still retains more of an animated look whereas Shadow of the Colossus appears more realistic. 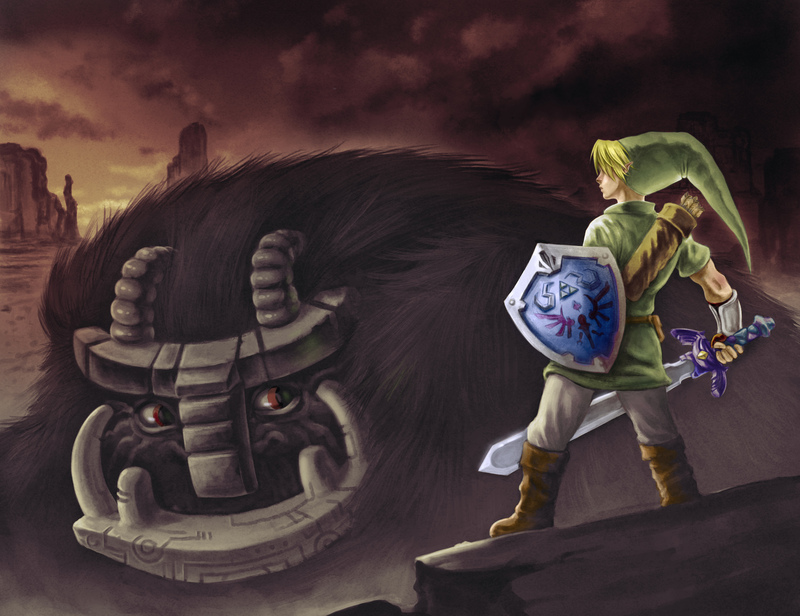 Nevertheless, along with the overall dark themes, Twilight Princess and Shadow of the Colossus both revolve around an otherworldly feel with the use of dark colors and bloom lighting. Great examples are the lighting design of the spirits in Twilight Princess and the ancient sword in Shadow of the Colossus. Both games excel in making the world feel transcendental, both worlds are focused around shadows and the darkness that looms within. Dormin of Shadow of the Colossus is a mysterious and selfish entity, unlike the Light Spirits of Twilight Princess who protect the land of Hyrlue. Dormin wants to be whole again by possessing a naive mortal who frees all the pieces of his soul locked inside each of the Colossi. More of an abstract comparison can be made between Dormin and both the Fused Shadows and the Mirror of Twilight. The Fused Shadows and the Mirror of Twilight both only work when all of the pieces are put back together; but even separately, they have the power to influence their holders. Likewise, in Shadow of the Colossus, we can see the pieces of Dormins’ soul slowly envelope Wander and slowly corrupt his being. Although in Twilight Princess, there is benevolence to thwart the darkness, dark magic is a common element amongst both games. Overall there is a healthy balance of similarities and differences between Twilight Princess and Shadow of the Colossus. They are similar in play style and themes, but differ in story and resolutions. I enjoyed my experiences with each game, and I happily go back and replay each from time to time. Shadow of the Colossus has many Zelda elements in it which made it a perfect candidate for a game that is inspired by Zelda. Sammi Baker is an Original Content Editor at Zelda Dungeon. She enjoys Zelda and YouTube playthroughs because she’s bad at playing video games! Follow her here on Twitter! Feature art by SoyUnGnomo, iwilding, EternaLegend and ShadowMKII for the fan art!